1. For the apple-vanilla muffins: Preheat the oven to 350 degrees F and center an oven rack. Line a mini-muffin tray with your favorite liners. 2. Combine the flour, baking powder, baking soda, salt and nutmeg together in a large bowl. 3. Combine the sugar, butter and vanilla in the bowl of a stand mixer fitted with a paddle (or in a large bowl if using a hand mixer). Beat on medium-high speed until light and creamy, about 4 minutes, scraping as needed. Add the egg and beat until incorporated (don't worry if the batter curdles). Adjust to medium-low speed and alternate adding the flour mixture and the sour cream in batches, beginning and ending with the flour. Fold in the apples using a spatula. 4. Grease a small ice-cream scoop (about 1 1/4 inches) with nonstick spray and fill the liners about 3/4 of the way to the top. 5. Bake, rotating halfway through, until a toothpick inserted in the muffins comes out clean and the tops spring back when touched, 10 to 12 minutes. Let rest in the hot muffin pan for 3 minutes, then transfer to a cooling rack. 6. For the cider glaze: Boil the cider with the cinnamon stick over medium-high heat until the cider is reduced to about 1/2 cup, about 20 minutes. Whisk in the honey and continue to boil until the liquid is syrupy and just coats the back of a spoon, 4 to 5 minutes. Discard the cinnamon stick and remove from the heat. Whisk in the confectioners' sugar and transfer to a small bowl. Let sit until slightly set but still warm, about 3 minutes. 7. Dip the tops of the muffins in the glaze and serve. 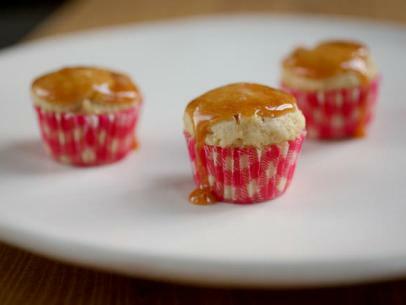 Small, crisp apples like Gala or Pink Ladies are perfect for these little muffins.